I was asked by one person, what exactly is it that we're supposed to do to be mindful? What is it that's supposed to happen? The question is one that I so relate to and so reflects how most of us are in the modern world. We live in a world where we are used to doing things, used to making things happen. Yet, we're not so used to letting things be, to letting them develop or come to us. Even the best, most popular, writers that I know don't say what to do, how to make things happen. They say that when we consistently focus on our breathing, mindfulness will naturally arise. But for someone still very much starting to learn to be mindful that can be frustrating as it doesn't tell us what to do. It's passive and I'm used to taking control! To doing! Hmmm...here's something different already. Early on, I too wondered about what to do to be mindful. Honestly, the doing part is to witness our breathing, our thoughts. To notice. To observe. 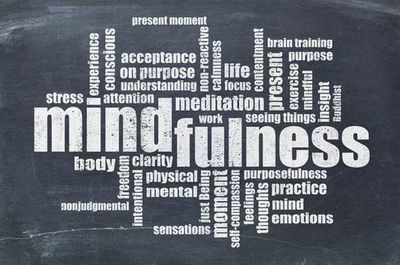 Mindfulness does come, the well known writers are right, and as it does we develop a new way of relating to ourselves and the world we are living in. After I worked to "just come back to my breathing" to "label thoughts that would come into my head as 'thinking'" while meditating, I eventually found that I became less and less lost in the maze of my thinking and did less reaching for control. I started to see over the walls of the maze and to find a path through some of the hardest times of my life. This didn't come by some visible act, but by just trusting that staying in the moment would lead to change in my life. I am still (and always will be) a student. As a student, the old familiar ways of dealing with day-to-day life still come up for me. In other words, I still struggle with trying to control versus letting go and letting things just come. But I've gotten pretty good at noticing when I do that and instead try to connect to my breathing and to the present moment. I'll share a couple of stories that I hope illustrate how staying in the present moment allows us to see beyond the maze of worry, anger, fear, hope...and to be okay in this moment. The first story was shared with me by a mountain climber that I feel fortunate to work with. He just returned from a trip to the Himalayas and early in the trip he lost his cell phone. "Oh no!" he thought, "this can't happen". Despite starting mindful practice, he said he was really upset about it for a couple of days. Until, he realized that it ​was​gone. Then he accepted the loss of the phone and the frustration then flowed past him, leaving him present in what he was doing. The second story is that later, he was unable to summit and told me that after a while he turned toward the situation and really noticed his feelings about not summiting. After staying with it for a bit, just noticing it, he stopped blaming himself and realized that he had done all he could and it was just what it was. He said he then looked out from the ledge he was sitting on and noticed the awesome beauty of the mountain ranges stretching to the horizon and felt fortunate. I hope that these words and stories help to illustrate that if we really do take time to practice mindfulness daily, changes in our lives will really happen. Though it may seem passive, it's really not. It's just active in a different way. As always, please reach out if you have any questions or comments.